The Trump Administration in its proposed FY 2020 Budget has proposed elimination of the workers’ compensation reverse offset. The elimination will act as a cost saving measure and will level the playing field for all workers’ compensation system throughout the United States. has proposed elimination of the workers’ compensation reverse offset. The elimination will act as a cost saving measure and will level the playing field for all workers’ compensation system throughout the United States. has proposed elimination of the workers’ compensation reverse offset. The elimination will act as a cost saving measure and will level the playing field for all workers’ compensation system throughout the United States. Johnson & Johnson continues to be hit with verdicts in cancer cases flowing from exposure to its baby powder that contained talc. The 2019 Supplement for NJ Workers' Compensation Law will be shipping shortly. Order now! Litigation is advancing against the distributors and resellers of paint strippers containing methylene chloride and NMP. The lawsuits were filed for damages resulting from the alleged exposure, illness and death of users of the products. The firm of Jon L. Gelman is a specialty law office concentrating its practice in the litigation of catastrophic and serious injuries resulting from work-related exposures and traumatic events. Our clients are located throughout the United States. We are dedicated to utilizing our knowledge and skills in conjunction with the most modern technology to provide the best possible legal representation. 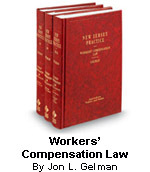 Our practice is built on a strong foundation of in-depth knowledge of the subject matter which is reflected in the 3-volume treatise entitled Workers' Compensation Law , (Thomson-West), that we authored, and in the 3-volume national treatise, Modern Compensation Law, (Thomson-West), that we co-authored. Our scope of representation ranges from complex workers' compensation actions to product liability claims throughout the country.